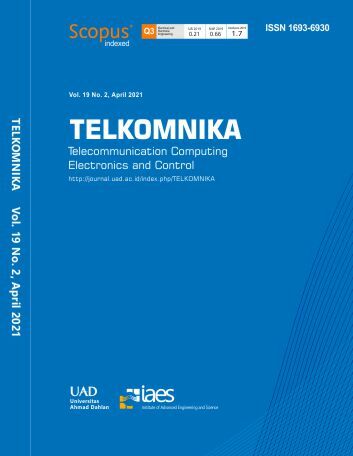 TELKOMNIKA (Telecommunication, Computing, Electronics and Control) ISSN: 1693-6930, e-ISSN: 2302-9293 is a peer-reviewed, scientific journal published by Universitas Ahmad Dahlan (UAD) in collaboration with Institute of Advanced Engineering and Science (IAES). The aim of this journal is to publish high-quality articles dedicated to all aspects of the latest outstanding developments in the field of electrical engineering. Its scope encompasses the applications of Telecommunication and Information Technology, Applied Computing and Computer, Instrumentation and Control, Electrical (Power), and Electronics Engineering. It was first published in 2003. Beginning with issue 1 of volume 16 (2018), TELKOMNIKA will be published as a bimonthly journal (6 issues/year). The journal registered in the CrossRef system with Digital Object Identifier (DOI) prefix 10.12928. The Journal has been indexed by SCOPUS, Google Scholar, Scholar Metrics etc; accredited 'A' Grade by DGHE (Ministry of Research, Technology and Higher Education, Republic of Indonesia); registered BASE - Bielefeld Academic Search Engine and CORE KMi, etc. The Journal also have a license agreement with ProQuest LLC and EBSCO Publishing. Authors should submit only papers that have been carefully proofread and polished. Manuscripts are accepted with the understanding that they are an original or extended version of previously published papers in conferences and/or journals and that, if the work received an official sponsorship, it has been duly released for open publication. Before submission please make sure that your paper is prepared using the journal paper template. The authors must refer to TELKOMNIKA Journal for writing format and style (Please download and use as a template for initial manuscript submission in .DOCX or LATEX). This will ensure fast processing and publication. Any papers not fulfilling the requirements based on the guideline to authors will not be processed. If you have any problems with the online submission, please do email to telkomnika [at] ee.uad.ac.id (subject: Your Name_Problem with Online Submission), and cc: tole [at] journal.uad.ac.id, tole.uad [at] gmail.com. If until now your extended paper has not yet been accepted for publication in our journal, please see Editors message below. (3) results achieved. It describes clearly what has been done before on the problem, and what is new. The goal of your extended paper is to describe novel technical results. (2) A system construct: such as hardware design, software system, protocol, etc. ; The main goal of your revised paper is to ensure that the next person who designs a system like yours doesn't make the same mistakes and takes advantage of some of your best solutions. So make sure that the hard problems (and their solutions) are discussed and the non-obvious mistakes (and how to avoid them) are discussed. (4) A theory: consisting of a collection of theorems. (3) Identifying the significance of the results: what improvements and impact do they suggest. Second, change title of your paper to more suitable title. The title summarizes the main idea or ideas of your study. A good title contains the fewest possible words needed to adequately describe the content and/or purpose of your research paper. Rarely use abbreviations or acronyms unless they are commonly known. (The technical guideline how to update your paper title was submitted to correspoding authors). When your extended paper reached us, it will be re-checked & reviewed by Editor(s) and Mentor(s) based on your response to Mentor & Coach comments and the following criteria: Relevance, Significance, Novelty, Technical correctness, Experimental/evidential support, Clarity of presentation and Reference to prior work and publications. In case we found that authors do not extend his/her paper seriously, we will cashback ICW-TELKOMNIKA registration fee and REJECT his/her paper. I am looking forward to receiving your extended paper. TELKOMNIKA Telecommunication, Computing, Electronics and Control (Scopus indexed journal) is a peer-reviewed scientific journal publishes high-quality articles dedicated to all aspects of the latest outstanding developments in the field of electrical engineering. TELKOMNIKA TCEC is calling for academics with sound academic background and who want to leave their footprints on the sand of time to serve as editors. Applicants must have significant publishing his/her specific field of research and reviewing experience (min H-index: 5 in Scopus/Thomson Reuters Web of Science database).